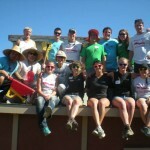 This is the second year Rotaract | SLO has partnered with Ventura Rotaract and Corazon on a one day build trip to Millenia, Mexico. Corazon is a non-profit organization that was started after two motivated individuals went to Mexico in 1987 and saw a need for homes. 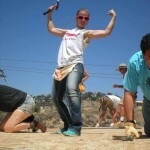 They decided a way to build a home in a day and have been taking groups of volunteers down to Mexico for the last ## years. Our day started bright and early, crossing the boarder at 6:00 AM. We arrived at the build site a little before 7:00 AM, where we were able to meet with the family that was receiving the home we’d be building. The family was kind, sweet, and very humbled at our being present there to help them. After a few safety lessons and some planning, we split into two groups: the painters and the builders. The painters began painting about 25 boards of plywood that would become the walls of the home. The builders began constructing the walls and preparing and area on the existing structure for our new structure to be attached. In what seemed like no time at all, walls were being put up and it was starting to look like a home! After we had assembled the walls, we took a break for lunch. The family prepared an delicious meal of tamales, beans, and rice for us. It was nice to be able to bond with Ventura Rotaract while we all enjoyed lunch. The afternoon was consumed with more building, painting, and roofing. By the end of the day we all knew how to lay roofing and were ready to present our home to the family. After a short dedication ceremony, we said our goodbyes to the family and headed to enjoy some food with Ventura Rotaract before heading back across the boarder. The Mexico build trip embodies the Rotaract’s philosophy of “fellowship through service” as we work alongside our fellow Rotaractors to better others lives. 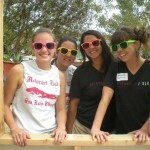 We are looking forward to continuing our efforts in Mexico with Ventura Rotaract and Corazon. August 9, 2013 in Projects, Rotaract.